Where Did the Dow Come From? The Dow Jones Industrial Average is a stock market index that tracks the stock prices of the top 30 U.S. companies. Analysts use it to gauge the health of the stock market. It reflects investors' confidence in those companies and in the economy overall. The Dow is calculated by adding up the stock prices of all companies in each index and dividing it by the number of companies. There are certain adjustments made to account for stock splits and other special considerations. The Dow averages don't take into account the number of shares outstanding. A company with a $200 share price will have more influence on the Dow than a company with more shares, but only a $10 price. For this reason, many investors follow the Standard & Poor’s 500 index instead. The two indices are highly correlated, which means they move together. In 2012, the Dow Jones Indexes were bought by S&P Dow Jones Indices LLC. It's a joint venture between S&P Global, the controlling member, and the CME Group. It also owns the S&P 500, the Case/Shiller housing index, and the VIX volatility index. There are also Dow averages for the transportation and utility sectors. 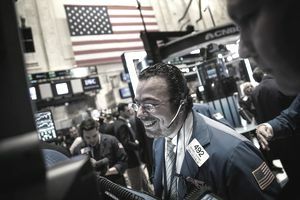 The editors of the Wall Street Journal select stocks of companies they think best epitomize each of the three sectors. The Dow Jones Industrial Average™ or DJIA tracks the share price of 30 companies which best represent their industries. The market capitalization of these stocks accounts for almost one-quarter of the total U.S. market. It is the most quoted market indicator in the world. The 30 companies included are: 3M, American Express, Apple, Boeing, Caterpillar, Chevron, Cisco, Coca-Cola, Disney, E! DuPont De Nemours & Co, Exxon Mobil, Goldman Sachs, Home Depot, IBM, Intel, Johnson & Johnson, JPMorgan Chase, McDonald's, Merck, Microsoft, Nike, Pfizer, Procter & Gamble, Travelers Companies, United Technologies, UnitedHealth, Verizon, Visa, Walgreens Boots Alliance, and Walmart. The Dow Jones Utility Average tracks 15 utility stocks. Since utility companies are big borrowers, their profits are enhanced by low interest rates. So, the Utility Average declines when investors are expecting increases in interest rates, making it a leading indicator. The Dow Jones Transportation Average tracks airline, trucking, and shipping companies. It is a lagging indicator. Use it to confirm the trend set by the Dow Jones Industrial Average. Transportation companies can only make their profits after the product has been manufactured and is available to ship. If the DJIA increases but the Transportation Average doesn't, then demand has fallen for those companies' products, and they aren't being shipped. The Dow Jones Utility Average tracks 15 utility stocks. Since utility companies are big borrowers, their profits are enhanced by low interest rates. Therefore, the Utility Average declines when investors are expecting increases in interest rates, making it a leading indicator. The Dow Jones Transportation Average tracks airline, trucking, and shipping companies. It is a lagging indicator. Use it to confirm the trend set by the Dow Jones Industrial Average. Transportation companies can only make their profits after the product has been manufactured and is available to ship. If the DJIA increases, but the Transportation Average doesn't, then demand has fallen for those companies' products, and they aren't being shipped. The creator of the Dow Jones Averages was journalist Charles Dow, the founder of the Wall Street Journal. Along with statistician Edward Jones, he founded Dow Jones and Company. On February 16th, 1885, Dow began publishing a list of 12 stocks. There were two industrial companies and 10 railroads. By 1889, he expanded it to eight more industrial companies. This list later became the Dow Jones Transportation Average, which included air freight and other forms of transportation. The Dow Jones Industrial Average™ was created on May 26, 1896, and consisted of primarily commodity-based companies. Its value was 40.94, which means the average stock price of the twelve stocks was $40.94. American Cotton Oil became part of Best Foods. American Sugar was turned into Amstar Holdings. American Tobacco was broken up by 1911 antitrust action. Chicago Gas is now part of People Energy. Distilling & Cattle Feeding was turned into Millennium Chemical. General Electric remained in DJIA until 2018 when it was replaced by Walgreens Boots. Laclede Gas is still in business but dropped from Dow in 1899. National Lead is now NL Industries, removed from Dow in 1916. North American was a utility broken up in the 1940s. Tennessee Coal & Iron was bought by U.S. Steel in 1907. U.S. Leather Pfd. was dissolved in 1952. U.S. Rubber is now part of Michelin. The DJIA expanded to 20 companies in 1916. In 1928, it grew again to 30 companies, right in time for the 1929 stock market crash. The Dow closed above 100 on January 12, 1906. Thanks to the Great Depression, the Dow didn't reach its next landmark of 500 until March 12, 1956. It took 16 years for the Dow to double to 1,000 on November 14, 1972. It took another 15 years to double again. Despite the 1987 stock market crash, the Dow doubled again in just eight years, reaching 4,000 on February 23, 1995. The Dow reached its next milestone, 10,000, on March 29, 1999, shortly before the 2001 recession. The Dow reached a peak of 14,164.43 on October 9, 2007. During the Great Recession, it plummeted 80 percent to 6,594.44 on March 5, 2009. It didn't regain its pre-recession high until March 11, 2013, when it hit 14,254.38. The Dow closed above 15,000 when it hit 15,056.20 on May 7, 2013. It exceeded 20,000 when it closed at 20,068.51 on January 25, 2017. The Dow's highest closing record is 26,828.39 set on October 3, 2018. Are We in a Bear Market Now? How Do S&P Ratings Protect You? What Does the MSCI Index Track? How You Can Tell If It's a Stock Market Correction or a Crash?